Let’s talk about a tough topic for some of us: our bodies. One would think that the home we wear day in and day out would be something we would have crazy love for, but for so many of us, that is far from the case. First thing’s first: body love is a journey and very much a practice. Our bodies ebb and flow naturally, all throughout our lives. It’s a part of life. Adapting to these shifts can be challenging. For many of us, women especially, the first big shift that can throw us for a loop is puberty. Naturally during this time, our bodies get bigger, and it can feel awkward. But all of this happens for us to be able to function properly and down the road be able to have children. I remember that shift very clearly as probably a lot of you do. I hit puberty early; I was 10. Being one of the first in my class to hit the growth spurt should have been something I was excited about or even proud of, but it brought on the opposite. I felt awkward. I thought I stood out when all I wanted to do was blend in. I towered over other kids, or at least that was my perception. Perhaps the way we handle that shift in life is a predictor of how we handle other changes in our bodies down the line, or maybe that was just me. But it was a hard thing for me internally. Needless to say, body shifts were not easy for me over the years. Lots of ebbs and flows, and yet all I wanted to do was gain control and reverse the natural flow of my body. The thing is, just like life has phases, so do our bodies. They shift and change, grow and shrink and it’s all completely normal. The past several years I have been working really hard on this whole body love thing. It all took wind when I started practicing yoga. That was the first time I started to fall in love with my body and appreciate the things that it could do versus obsess over every little detail of the way it looked. Then my first pregnancy showed me what real and true body love was. Losing our baby was a big hit on that and then further down the road a second miscarriage, hormones upon hormones and plenty of fertility treatments added some extra packaging to my body that I was okay with at the time because I was certain the outcome would be a baby. But when it did not go as planned, I was stuck with this extra cushioning and nothing to show for it. The craziest thing of all is that our shift to adoption actually was a major catalyst in getting me to where I am now in regards to my relationship with my body. For one, it was the first time in years I was not on any form of hormone. And second, it brought on an epiphany in regard to the way I was eating. It was then that I realized that every piece of food I was putting in my mouth was strictly to get pregnant. And so I was at my peak of good food versus bad food and thus my clean eating phase. I was wrapped up in restriction and it was having a lot of negativity with my relationship with food as well as my body. Needless to say, the time I got rid of food rules coincided with gaining my love and trust for my body back. And so here I am today, almost a year later. And I wanted to bring it up because my body has shifted once again. It started when we adopted Sam. Some parts of my body are a bit more squishy than they were before Sam. Naturally, with a newborn, working out is not top priority and it happens when it happens–if it happens. I would be lying if I told you that loving this new softness came natural to me because it did not. There were still thoughts that crept in saying, “Oh no Lorie, you’ve gotta get on top of this,” or “Maybe cut back on ______,” or other things that my mind liked to tell me in the past. But the difference now is actually several things. First and foremost, all I have to do is look at Sam and realize the sole reason for this shift. Lots of snuggles, kisses, cradling, rocking and other things that have brought me so much joy are the reason for much fewer workouts. Second, I enjoyed the holidays in the best way. I ate the goodies without the guilt for the first time in a loooong time and it felt so good. Best holiday season in the books and I wouldn’t change a thing. Especially all the Dark Chocolate Peppermint Puppy Chow I got to enjoy! And third, I have just been reminding myself what I said in the beginning. This is a phase that my body is in. It’s not the end of the world. It’s nothing to go crazy over or reason to go off the deep end. It’s been single digit temperatures so getting out to walk is much more difficult and that will change in the spring. No need to go overexercise or cut back on the things I love. I guess what I am trying to say is that our body goes through changes and that is 100% normal. But if we can’t learn to be ok with our bodies in these phases, then it really doesn’t matter what we do, we will not be satisfied or happy with what we see in the mirror. If I can’t accept my body with a little extra softness, then what’s to say that losing a few pounds or toning things up a bit is going to suddenly make me fall madly in love with it. From my own experience, it doesn’t. Because every pound that is lost leads to desire to lose another pound, and another…and so on. I practice self care, I move when I can, I try to take care of my body to the best of my ability without going overboard. And if the phase of my life I am in leads to a shift in my body, then I will ride the wave through the ebb and the flow, and I will do it with grace. This recipe is the perfect recipe to share today for a few reasons. One, it’s freezing around here lately. However today is like a heat wave with a high of 37°F! And two, it’s a recipe that would not have been acceptable if I wasn’t feeling good about what was in the mirror–no matter how amazing it tastes. And it is GOOD. I have made it several times already over the past month and Anthony goes back for seconds each time. He is my toughest critic so I will consider this one heck of a win! I have recently become obsessed with Siracha. I know, I am very late to the party. But I was never really a fan of tobasco so for some reason I just automatically ruled it out. I added it to tocos one night and was pleasantly surprised by how much better the tacos were. So then I added it to just about everything I could think of. No disappointments there either. 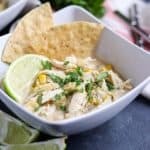 Before this recipe, I had never made a white chicken chili. However, a friend of mine had a baby and I wanted to bring dinner over when I met the little nugget. The problem? She is allergic to tomatoes. Sad, but true. So that knocked out all of my usual dinners that I share with friends who have had babies or are going through tough times. My usual go to’s are either my Sweet Potato Chili or my Baked Pasta with Spinach and Mushrooms. But both have tomatoes, and a lot of them. So I had to start at square one. And white chicken chili was where I started. I have no idea what took me so long on this one either. A touch of cream and cream cheese, lime juice and a hint of siracha make this chili unbelievable. It’s creamy and hearty and full of flavor. For my dairy free friends, I believe Kite Hill has a dairy free cream cheese you could try and perhaps a nondairy cream as well, or even a yogurt. If you try it that way, let me know what you think! Also, if you want this one extra super thick, before adding the shredded chicken back into the crock pot, blend a couple cups of the soup in the blender and then add back in. It makes the consistency much thicker. If you prefer a little creamy broth, then keep it just as it is. Both ways are amazing. The other big win for this recipe is all in the toppings. Avocado, cilantro, lime wedges, sour cream, crushed tortilla chips–load it up with all of your favorites! Place chicken at the bottom of slow cooker. Season with salt and pepper and spread garlic on top. Top chicken with corn, chiles, beans, cilantro, cumin, chili powder and oregano. Pour broth over and squeeze lime juice on top. Cover and cook on low 6-8 hours or high for 4-6 hours. When chicken is cooked through, remove from slow cooker and shred. Before adding chicken back in the crock pot, remove about 2 cups soup and add to a medium. Whisk in half and half and cream cheese until smooth. (If you want to thicken the chili as well, blend this mixture in a high powered blender before adding back to crock pot.) Pour mixture back into slow cooker and stir well. Add chicken back in as well and stir. Set to 'keep warm' for about 30 minutes and then serve with all of your favorite toppings! I love a good hearty bowl of chili! And I’m a big fan of Sriracha! This sounds amazing! I love sriracha too! And anything in the slow cooker is awesome this time of year! I have been looking for a new white chili to try out. This looks perfect. Spicy and hearty for these cold nights. Yep, ready for Spring but if the cold is here gotta make the best of it! You always know just what to say. Lovely post and insights, thanks for sharing all that! And welcome to the world of sriracha! haha! Looks so cozy and comforting, perfect for snuggling up on these cold winter days! 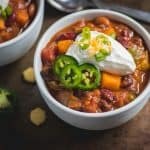 I have been craving sweet potato chili lately so I bet this really hits the spot. OOOOH, sweet potato chili is my other fave! 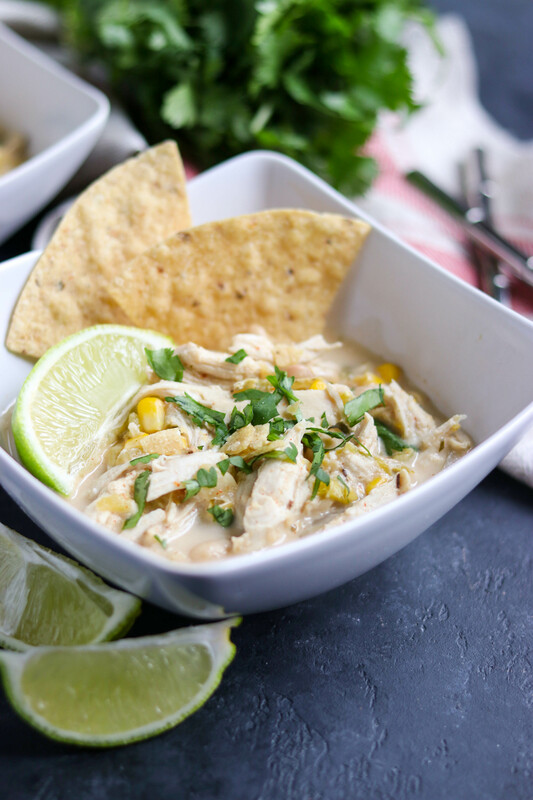 I’m obsessed with slow cooker recipes! Can’t wait to make this white chili. 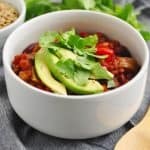 My husband would love this chili for dinner! And yes, accepting the shifts in our body with grace is my goal too. Thanks for sharing that! I love how creamy and filling this looks! Perfect comfort food in this cold weather! Yep, you really can’t go wrong! Well you have been having some very good dreams then! Ha!